A good time to remind everyone that the recordings of the presentations will be made available online as soon as possible. Sign-up to the OpenMPCon newsletter to make sure you receive the announcement when they are available. 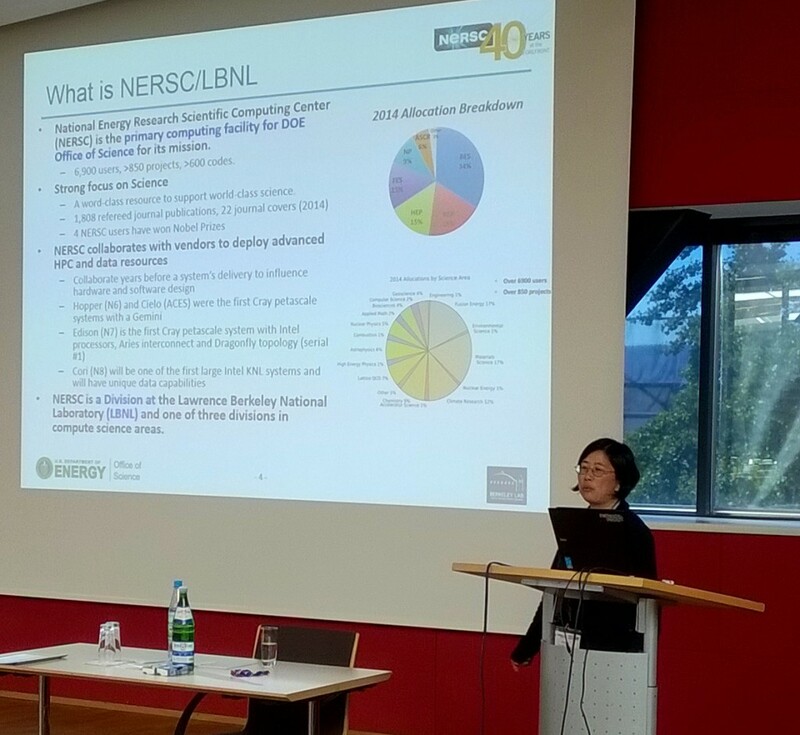 11:30am – Helen He from the Lawrence Berkeley National Lab provides an overview of the use of OpenMP at NERC in talk that is packed with useful nuggets of information useful to OpenMP developers based on the large number of projects and codes that they work on. Check out the tips, tools and performance observations when these slides are posted online. 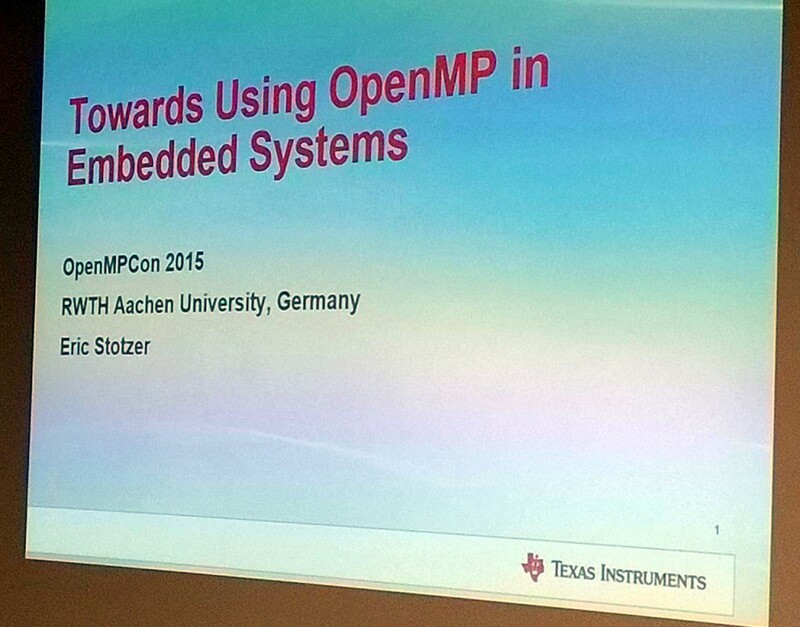 11:00am – The OpenMP conversations continue during the breaks. 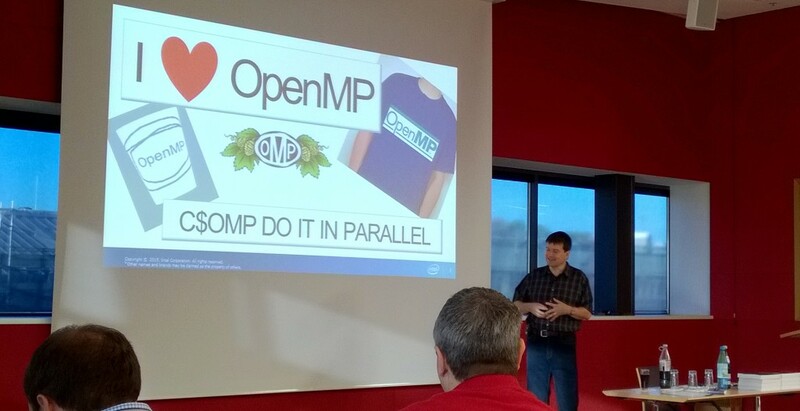 10:00am – If you’re interested in the latest performance comparisons between OpenMP 4.0 and OpenCL then this presentation by Sergey Vinogradov of Intel and this project with the University of Bristol is a most see. 9:00am – After a great social event and dinner at the Aachen Museum things get started again this morning with an enlightening talk by Professor William Tang from Princeton University. In his talk William outlined the “Moon Shot” like challenges of delivering Fusion energy and how OpenMP is being used by the scientific community to deliver portable, high-performance extreme scale applications. 3:00pm – The dual track sessions commence with four technical presentations. 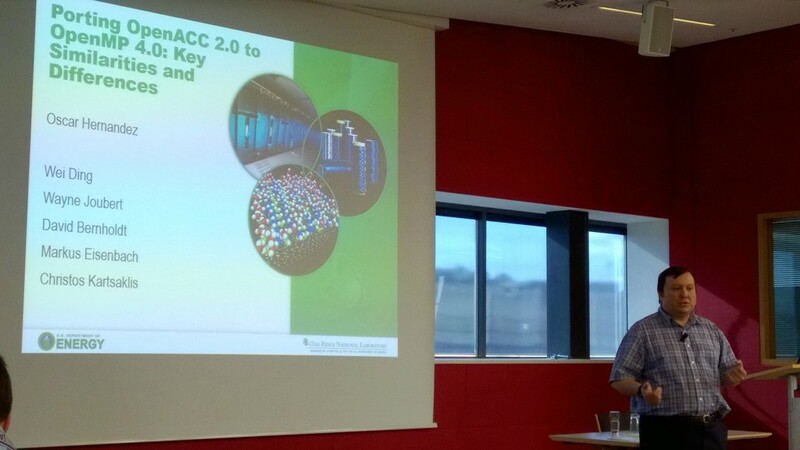 Oscar Hernandez from Oak Ridge National Lab shares the key differences and similarities observed when porting OpenACC 2.0 to OpenMP. As with all the presentations, the slides and audio recordings from this session will be made available online as soon as possible after the conference finishes. For those tracking GCC support for OpenMP, Martin Jambor of SUSE Linux provided an update on the compile target construct support for Heterogeneous System Architecture (HSA) accelerators. 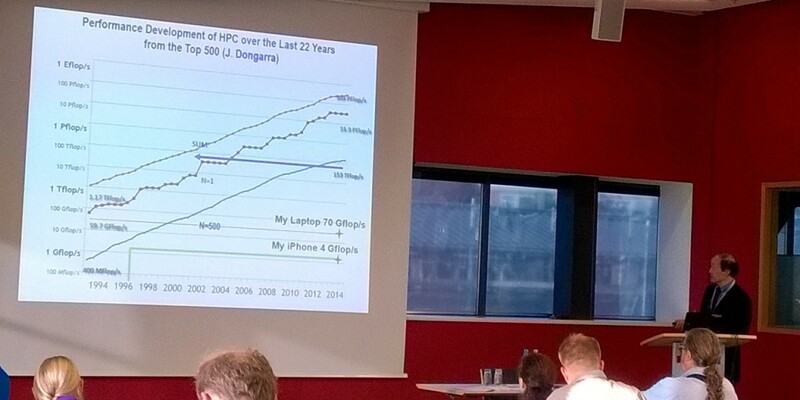 Application portability is of increasing importance in many projects and applications and Tim Mattson presented “Enabling Application Portability across HPC Platforms” on behalf of Alice Koniges and the team from the Lawrence Berkeley National Lab. 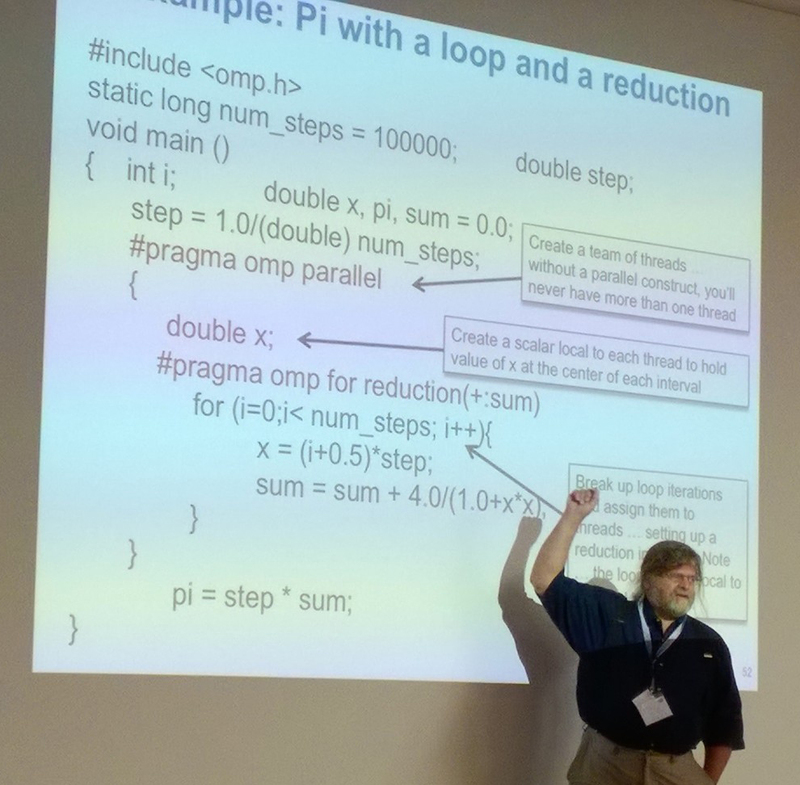 The talk by Mark Bull from EPCC (University of Edinburgh) was packed with Tips, Tricks and Gotchas useful to all OpenMP developers and gleaned from his experience across multiple applications and platforms. 2:00pm – After another great Aachen lunch and time for discussion, the afternoon sessions begin with a Keynote from Eric Stotzer of Texas Instruments outlining the requirements of the Embedded community and suggesting how OpenMP could be extended to enable it to better serve as a programming model for embedded systems. 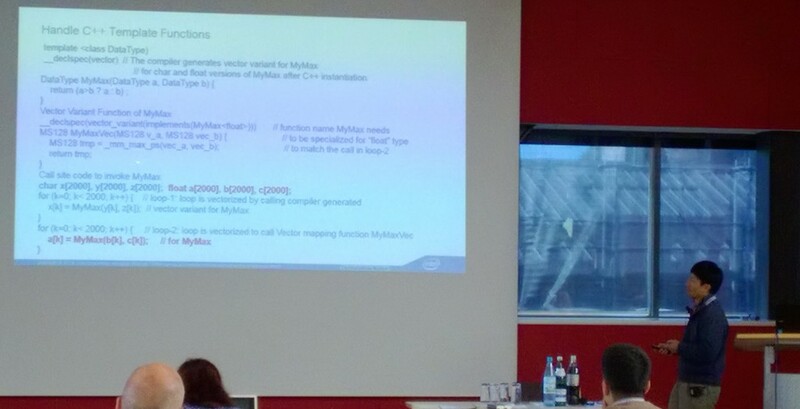 and Xinmin Tian from Intel providing developers with new insights into the effective OpenMP SIMD vectorization on Intel Xeon and Xeon Phi architectures. 9:15am – James Reinders, conference Keynote and evangelist at Intel shares the OpenMP experiences from real-world applications drawn from his recent book; High Performance Parallelism Pearls Volume Two: Multicore and Many-core Programming Approaches. 9:00am – Michael Wong, OpenMP ARB CEO kick-starts the first OpenMPCon technical sessions, stressing the importance of the event as a forum for developers to present and discuss their experiences and the practical application of OpenMP to solving real-world problems in HPC and beyond. 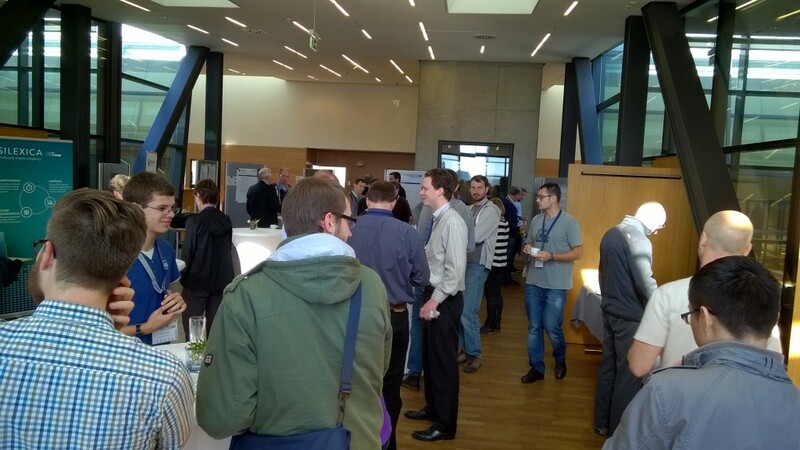 5:00pm onwards – After the sessions, delegates, including members of the language committee continue to discuss the details of the OpenMP specification, or work on agreeing where to go for dinner. 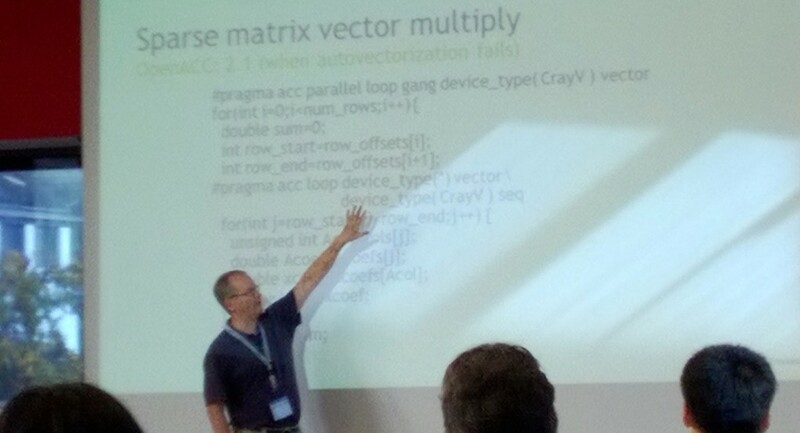 5:00pm – After an afternoon covering some of the more advanced features of OpenMP, Tim continues answering questions from the audience. 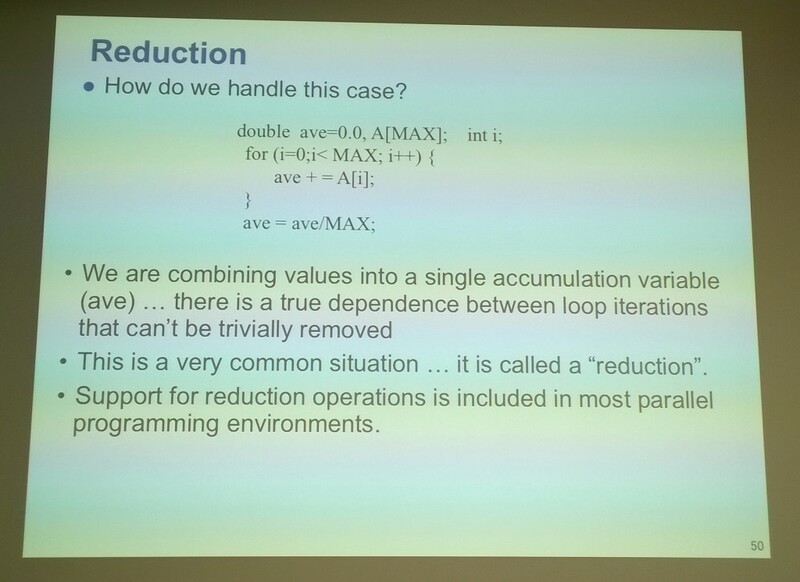 2:00pm – The afternoon sessions begins with an solution to the Pi loop/reduction example, plus some audience participation around declarations inside the loop and ‘old-school’ vs ‘new-school’. 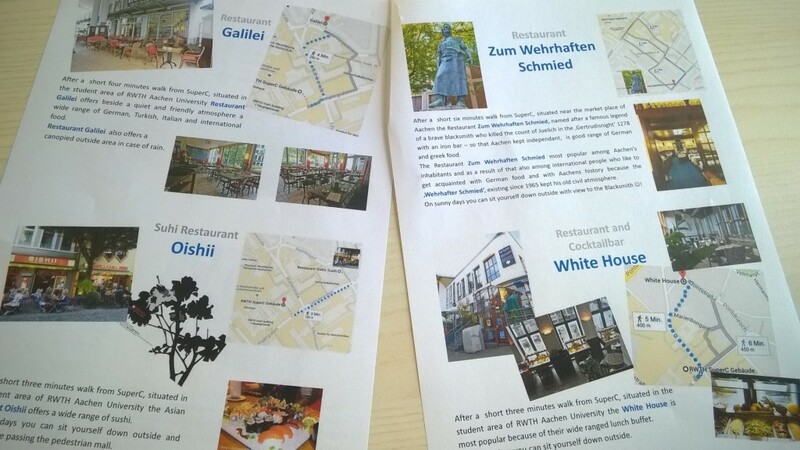 12:00pm – Delegates spread out into the beautiful town of Aachen to sample the delights of the local restaurants clutching their OpenMPCon lunch vouchers. Everyone seems to enjoy the opportunity to network with colleagues and old friends, as well as discuss the mornings learning objectives, amongst other things…..
11:59am – Last slide before lunch. How would you handle this case? 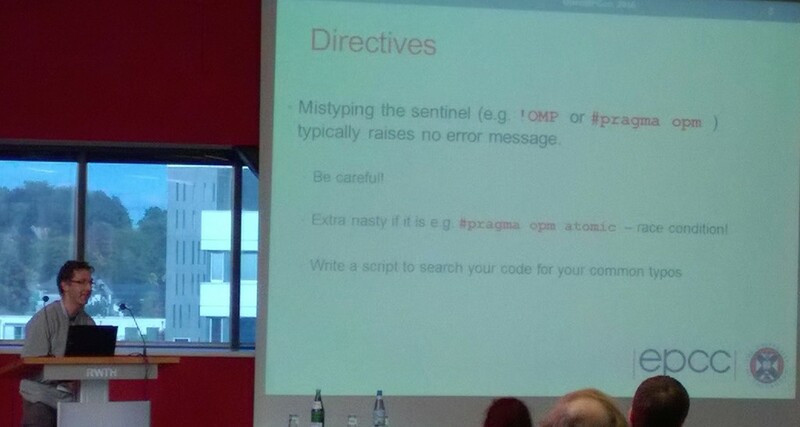 Pi as the example. All will be revealed after lunch. 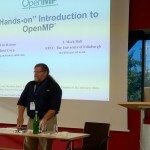 9:30am – OpenMPCon 2015 kicks-off in style with the always entertaining (and informative) “Hands-On OpenMPCon” tutorial presented by Tim Mattson (Intel) and Mark Bull ( EPCC, University of Edinburgh). Delegates successfully logged into RWTH University cluster, or using their own environments, to implement the exercises following each tutorial sessions, great Active Learning. Tim offers delegates the chance to win one of two copies of James Reinders latest book. One for asking the best question, one for the worst, nobody but Tim gets to know which prize they won! 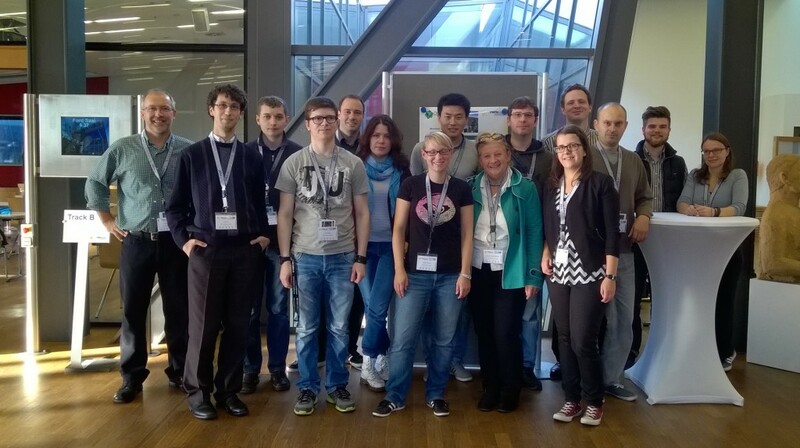 8:30am – Time for a quick group photo of the RWTH Aachen team that are helping put OpenMPCon and IWOMP together. Thanks to all for your help. Aachen and the SuperC venue are looking great, and some great weather always helps.